As former Fogarty-funded international scholars, we were stunned to learn about the funding cuts to the US National Institutes of Health (NIH) proposed under the President’s Fiscal Year (FY) 2018 budget, announced on March 16, 2017. We were particularly dismayed about the plan to eliminate the Fogarty International Center (FIC) at NIH. Through more than 400 research and training projects, the FIC has trained well over 5,000 scientists worldwide and involved more than 100 universities. This is an incredible global footprint and contribution, and any government should be very proud of this accomplishment. In a recent STAT news opinion piece, Prof Art Reingold, our former Fogarty program director at UC Berkeley, and one of us (MP) argued that eliminating the FIC will not make America great again. On the contrary, it will actually diminish the tremendous contributions to global health made by America and significantly undermine the global health field. In 1988, in response to the growing HIV/AIDS pandemic, which was clearly affecting the world’s poorest countries disproportionately, the FIC initiated a program entitled the AIDS International Training and Research Program (AITRP). This program was intended to address the inadequate research capacity of the countries that were worst-hit with rapidly growing epidemics of not only HIV/AIDS, but also TB, other opportunistic infections. Over the past 3 decades, AITRP has provided significant research training to more than 2,000 individuals from more than 100 countries.We were two among this incredibly fortunate group. We did our medical training in India, and were keen on higher education in public health, but had no means to fund ourselves. Our lives changed in 2000, when Prof Reingold offered us fellowships from AITRP, to pursue public health and epidemiology training at the University of California, Berkeley. This opportunity was the single biggest break we have had in our career, and it changed our lives. We will always be grateful. The importance of the AITRP fellowship in our careers cannot be easily quantified. We got a chance to learn from some of the best researchers & teachers in the world, collaborate with fellow trainees from several countries, conduct meaningful research in India & South Africa (which continues to date), publish several studies, and build research capacity in India and other countries. Today, both of us are tenured professors at McGill University. I (MP) am a full professor, holding a Canada Research Chair. I serve as the Director of Global Health Programs at McGill, and as an Associate Director of the McGill International TB Centre. In this leadership role, I am actively involved in ensuring that TB research is translated into policy. I am also engaged in the training of the next generation of researchers who will become global health leaders. I serve as an advisor to several leading non-profit agencies, including the Bill & Melinda Gates Foundation, WHO, FIND, TB Alliance, Stop TB Partnership, and the India TB Research and Development Corporation. I (NPP) am an Associate Professor in Medicine at McGill University, where I run an international research program on HIV and STIs. I am currently evaluating a HIV self-testing strategy (HIVSMART!) for in home, self-testing for HIV in Canada, and in South Africa. I am actively mentoring junior researchers and also helping to build capacity in low income countries. I co-director a course on Global Health Diagnostics as part of the McGill Summer Institute in Infectious Diseases & Global Health, and have created a company called Sympact-X to scale-up our award-winning HIV-self testing strategy. Thanks to the amazing opportunities we had as Fogarty trainees, we are now able to pay it forward. The Fogarty program at NIH is invaluable and irreplaceable global health resource. It is a splendid example of how the generosity of American people can produce outstanding researchers and scholars, and build valuable research capacity for countries to deal with major threats to health. It boggles our mind that anyone would want to dismantle such a wonderful, impactful program. We hope many more Fogarty supported researchers will speak up about this, support ongoing signature campaigns, and advocate to protect FIC and NIH. Staying silent is not an option. 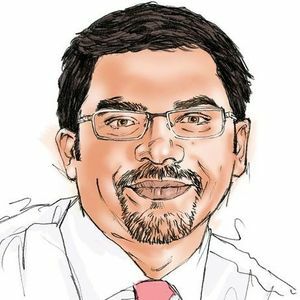 Madhukar Pai, is a Canada Research Chair in Epidemiology and Global Health at McGill University in Montreal. His research is focused on improving the diagnosis of TB, and on measuring and improving quality of TB care in high burden countries. (@paimadhu). Nitika Pant Pai is an Associate Professor of Medicine at McGill University, Montreal, and a researcher at the Research Institute of McGill University Health Centre. She has won many awards for her innovative HIV research, including the Accelerating Science Award Program (ASAP) Award, Maude Abbott Award, and Grand Challenges Canada Stars in Global Health Award (@Nikkipantpai).